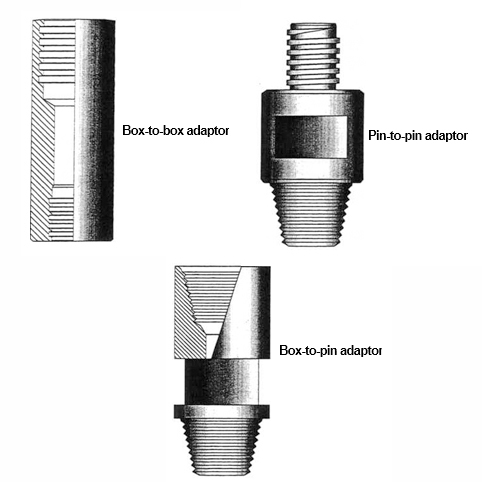 Adaptors are used when two different types or sizes of threads need to be connected to each other. Any combination of threads are available including DCDMA, wireline, metric, API standards and thread types used in DTH hammer applications (Halco, Holman, etc.). All adaptors are manufactured from the best quality heat-treated alloy steel. 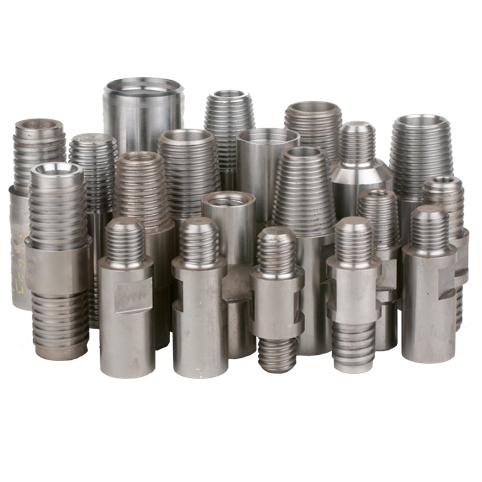 On request they may be further heat-treated or nitrided after machining to ensure the highest tensile strength and wear resistance.Optionally, spanner flats can be machined on adaptors to assist coupling and uncoupling. Some of the commoner adaptors such as rock bit subs, casing drive plugs and DTH hammer saver subs are available from stock. Others can be processed at short notice to customer requirements. When ordering please specify the connection type required at each end, and advise whether spanner flats or special heat-treatment is required.